... why not an integrated western road ...? ... why not an alternative scheme of a western link road to the railway station...? A worked-out solution following a western route would be so much better. This diagram also shows the route of an alternative, superior, direct main road between Westbury's railway station (one of the biggest in the West of England) and the A36 (the major road in the area, that the A350 runs into), which would be of lower cost and of far greater usefulness than an old-style rural bypass. This road would go straight to the proposed International Rail Freight Terminal, for road to rail (and rail to road) interchange at the existing tracks and sidings. 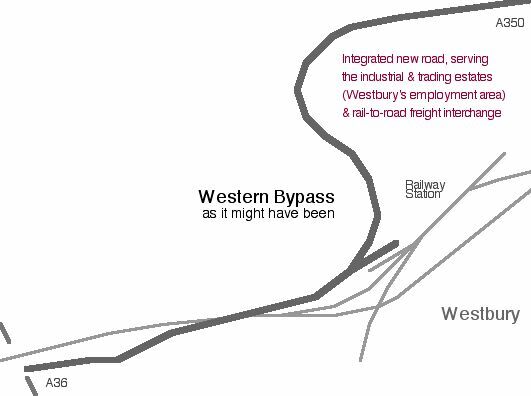 It is obvious to almost all (though the diagram may help) that a western road could be in the area of the railway lines and run directly to the trading estates. All main transport routes would then be integrated - on the west of the town, where the business is and the railway is. This diagram (based on Wiltshire Council's own Far Western route!) shows that villages, countryside and wildlife to the west would be little impacted, as the road would be beside the railway. The spring water sources, which are all on the east, would be left unpolluted. If you think about the long actual length of an eastern bypass, that would have to extend westwards, back around to the industrial estates, a western bypass, or a western heavy goods vehicle relief and rail access road, is better value. Here are some outline considerations of how to interface with the railway etc. The A36/A350 Corridor Alliance (ACA) propose a simple scheme to take traffic away from the centre of Westbury by utilising a series of link roads to the west. Here is ACA's basic diagram of suggested link roads and how they could work. This transport=environmental grouping of the Campaign for Better Transport, Friends of the Earth and local bodies of the Campaign to Protect Rural England, believe that major schemes along the A350 and A36 are counter-productive. ACA said that the eastern bypass plan was really the worst of all for Westbury. It could not resolve the transport needs of the area. Urbanisation, destruction of finest landscape and loss of trade in Westbury town centre would follow. ACA's alternative integrated link roads relief strategy for Westbury aims to: Reduce the traffic congestion and pollution in the town and the nearby villages; Provide direct routes to the industrial estates and rail freight terminal for HGVs; Protect the natural landscape to the east and to the west from further damage; Prevent the commuter housing development that is associated with a bypass; Create an integrated transport system and help to revitalise the town centre. ACA say that all of this could be achieved for a fraction of the cost of a bypass. It could also be implemented in far less time. Which would you rather have? Regardless, it is obvious by now that integrated transport is the solution.